Dr Ndasi is head of the Cameroon Clubfoot Care Project which began in 2013, with an initial Ponseti method training course given by Steve Mannion after which 4 pilot treatment centres were established. There are now 20 clinics covering approximately 40% of the country, with a plan to expand to cover the entire country over the next 3 years. The Ponseti method has proved extremely successful in treating patients in Cameroon presenting at under 2 years of age. Challenges have included lack of compliance due to travelling distance, brace provision and older children for whom Ponseti treatment alone has been successful only in a proportion of cases. In future it is hoped to develop referral centres, such as Dr Ndasi in Mutengene, for the treatment of older children with clubfoot. 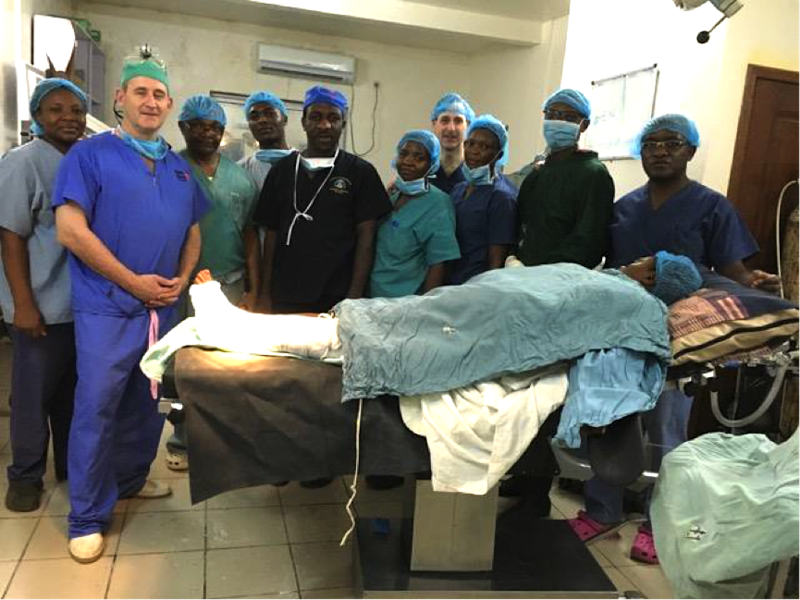 Mr Steve Mannion (WOC-UK President) on his recent visit to work on complex foot and ankle cases with Dr Henry Ndasi. Mutengene Baptist Hospital, Cameroon. February 2016.